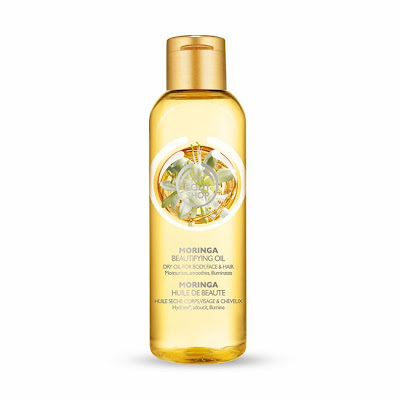 What it is: The Body Shop Moringa Beautifying Oil is an all-in-one, lightweight oil made with a blend of nut-derived nutrients including fair trade marula, kukui and sweet almond oils, which provide instant hydration. Beauty bonus: This oil can be used on the face, body and in the hair. We loved the versatility and quick absorption of this dry oil. Beauty bummer: The delivery system was slightly messy. A pump would definitely make application of this product a neater experience. Overall: This was my first foray into multi-purpose oil products ... and I think I'm in love. After my initial test, I found myself grabbing for this convenient oil for quick hair and face touch ups. It's non-greasy when applied, does not weigh hair down and has a very lovely white floral scent. It's a definite must-try, in my opinion. Nice! Talk about all natural beauty product! I am so thankful you shared this review! <3!